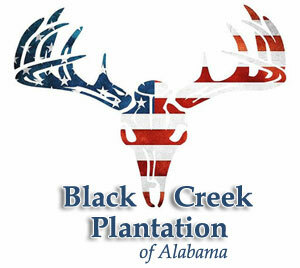 Below you will find information on Alabama hunting laws as well as tips to help make sure you pack everything you need to be prepared for a safe and fun trip at Black Creek Plantation of Alabama! • Only 3 antlered bucks per season, with one being at least 4 points of 1" or longer on one antler. • Only 1 buck per day. • You can harvest one doe per day, all season. • You must have your hunting license and pen in your possession while hunting. • Youth hunters must have a harvest record and pen in their possession while hunting. • You must be wearing 144" of hunters orange on; hat, vest, or cap. Depending on the time of year you are planning your trip to Black Creek Plantation, you will have a good idea of what type of clothing to wear. It can drop as lows as the 20's in the winter, so pack accordingly. Gloves, hats, and face masks are definitely recommended. Thermal, fleece and under armor are great under garments to help keep the cold out. Wool socks are a must for those cold mornings and afternoons. Remember, it's better to have more than less. 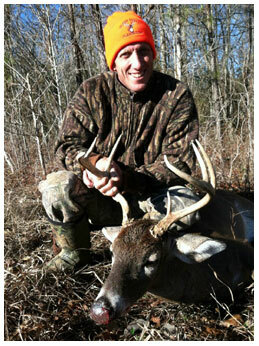 You must have an orange vest or cap while hunting or walking though Black Creek Plantation. Remember, safety first. During most hunts, there is a certain amount of walking to be done to get to and from your hunting location. You do not want to skimp on your boots. Not only do you want your feet to be warm, but you want them to be comfortable too. We recommend a nice pair of Muck Boots or Bogs...and definately plan to wear wool socks. Cotton socks are not recommended for cold mornings and afternoons. Depending on what you want to hunt will determine whether you need a rifle, shot gun or both. You will need to make sure you have plenty of ammunition with you as we do not supply this for you. If you have any questions on what type of gun to bring, please feel free to give us a call and we will be glad to offer some advice to help you plan. If you are planning to hunt with your bow, make sure you bring all of the extra equipment you need as we do not have additional supply. It would be wise to bring extra string, tuning tools and broadheads with you in case you need them. Union Springs has a store that carries a limited amount of hunting supplies but it is best to be sure you have everything with you ahead of time just in case they do not have what you may need or they are not open when you need it. Pack a good hunting knife with you, you may not ever need to use it but you never know when it might come in handy during your hunt. We recommend you prepare a hunting back pack that includes all of the hunting gear needed to make your trip at Black Creek a breeze. It is the easiest, most organized way to have all of your hunting essentials together in one place. The items below in addition to your hunting license, identification and pen will help get you started! We recommend a quality pair of binoculars. Of course this is optional but there is a lot to look for out there and having a great pair of binoculars to spot the sneaky ones is always a plus. Our favorite is the Nikon Action series and they are available for purchase at WalMart. They are on the higher end, but the quality cannot be compared for under $100. Pack a good flashlight and be sure you have new batteries. You will need your flashlight in the early morning walking to your hunting location and again when the sun sets on your way out of the woods. Make sure you bring your camera! Black Creek Plantation is a beautiful place and there of lots of great places to capture gorgeous photos of the property and hopefully your harvested wildlife for your memory books. You will need to bring Turkey calls if you plan to turkey hunt. If you prefer to use scents or calls while doing other types of hunts, take them along with you as we do not supply these items. We have provided a few websites on the right side of this page that offers additional information on scents & calls. Depending on what type of hunt you are doing, it can be a long time before you have a chance to eat so we recommend bringing bottled water and snacks such as granola bars to tide you over until lunch or dinner. Here are some other helpful items you may like to have in your pack. They are not necessities but never hurt to have on hand. If you are taking prescription medication, remember to plan accordingly if you will need to take it during the time you will be hunting. After you successfully harvest an animal, you will need a quality cooler to store the meat in for your ride home. We recommend a cooler that can hold dry ice if you are traveling a good distance home. You may also want to bring an additional cooler for your beverages. We do not supply your cooler. If you harvest an animal during your hunt, we will have the ice ready to pack your cooler with! The list below offers helpful products and stores that our members recommend and use for their hunting supplies and gear. Hopefully this will help you prepare for your hunting adventure at Black Creek! Do you have a hunting product or store that is not on our list and would like to suggest it here and trade links? Send us an email to BlackCreekPlantation@gmail.com!